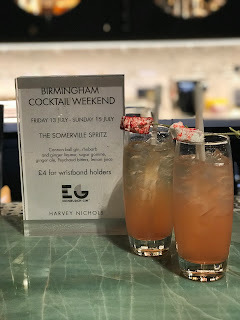 Whilst there's plenty of choices when it comes to eating and drinking in The Mailbox, Aluna is one of my favourites for the inventive cocktails, great service and smart but chilled vibe. 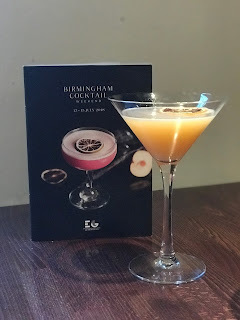 Many of you will know Aluna as a cocktail bar, and whilst they've always offered food, they've upped their game big time with the arrival of the new food menu. Designed by London consultancy Kinkou, the new menu features Asian fusion dishes inspired by the teams travels and training in London, New York and Shanghai. Tempted to try more? I was treated to a first look at the new menu. 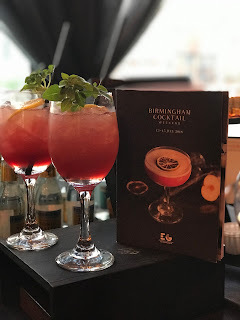 Arriving at the Canalside bar and restaurant, I headed straight to the bar and ordered a Flaming Ginberries (Beefeater, Hayman's Sloe, Blueberry, Cranberry and Lime) cocktail to get things started. 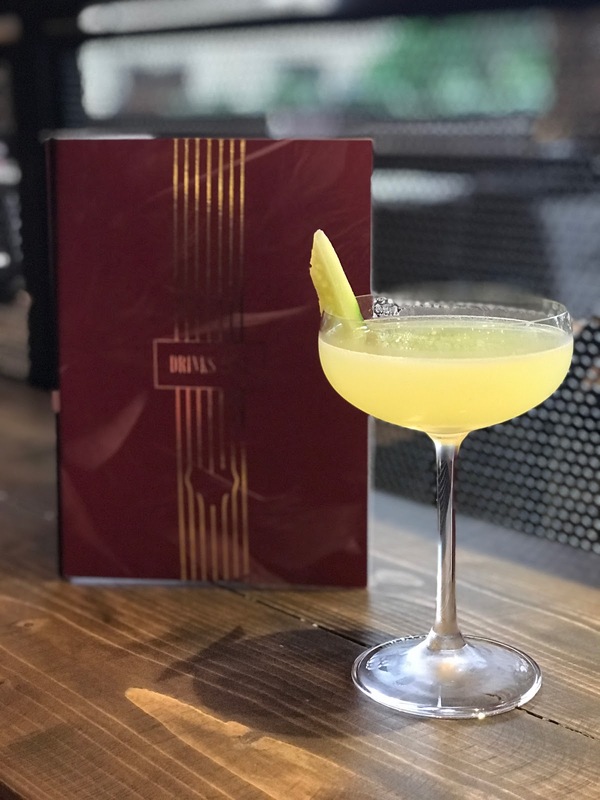 Aluna is well known for it's expansive cocktail menu, so picking a drink is harder than you think. I was then seated in a booth style table with a host of Birmingham's finest media stars. The staff came straight over to explain the menu, the difference between the small plates and large plates and how many to order of each. In the end, we decided to share many of the plates within smaller groups so we could all see and taste the new menu. The new menu is split into appetisers; plates to share, small dishes, salads and sides meaning you have the option to either share or order individually. Some of the plates to share we ordered were the Red Scallop Curry, Mitsuba Fillet Steak and Wasabi Lamb Chops. We also ordered some small dishes including the Chilli Salt Squid, Pan Roasted Scallops, Spicy Chicken Wings and Tiger Prawn Cookies (not GF). The staff were really helpful when it came to checking what was gluten free, and although the menu is not marked, our server checked with the chef what I could and couldn't eat. Please bear in mind that I can eat soy sauce though! My favourite dish from the above has got to be the Red Scallop Curry. Rich, creamy and full of balanced flavours including sweet and sour, this was an absolute showstopper. Everyone who tried it agreed it was delicious, so definitely try this if you do come in. Next, the Mitsuba Fillet Steak and Wasabi Lamb Chops. Great quality meat, a little spicy seasoning and great cooking just the way I like it (pink please). I also tried the Pan Roasted Scallops, which were perfectly translucent, plump and chargrilled to bring out the flavour, and Chilli Salt Squid, which had quite a kick. Onto the desserts, the rest of the table ordered the Praline Mi-Cut and Lemon Ginger Cheesecake. The Praline looked incredible, with an oozing rich chocolatey nutty centre. I ordered a French Martini for dessert, as you do. Overall, I was really impressed with the new menu. I haven't eaten at Aluna before so although I can't compare, the new menu is exactly right for the venue. As stylish as their signature cocktails, these dishes are picture perfect, light enough or filling enough to be eaten with or without a drink and more importantly full of flavour. I would happily come back to eat here and order a few meat and fish dishes, although I'd probably admit defeat on the vegetables next time! Aluna has seriously upped its game on the food front, offering not just tempting cocktails, but food that wouldn't be out of place in the trendiest of London bars. What is Three Church Road, you may ask? Well, it's a bar and restaurant that's hiding a secret. Can you guess what it is? Three Church Road is located in Edgbaston, Birmingham, a leafy and affluent area just outside of the city centre. This quiet, mainly residential area is home to Three Church Road within Audley St. George's Place Luxury Retirement Village. That's right, you don't have to be grey to enjoy the luxurious surroundings at Three Church Road. An impressive Victorian building, the restaurant is housed in the hub of the village where there's also a swimming pool and gym that's available for non member use, a bar, private dining room and even a library. Each room has been beautifully decorated and has a character of it's own, from the pink bar bistro to the turquoise lounge. A popular spot for birthday's, anniversaries and baby showers, I popped in for an after work dinner. Making my way into the main restaurant, I was seated at a wooden table complete with fine cutlery and starched napkins; Nando's this is not. As well as a fixed price menu with two courses for £17.95 and three courses for £21.95, there is an a la carte menu featuring classic British and European dishes such as Sausage and Mash, Duck Parfait and Ribeye Steak. I love the fat that everything is clearly marked for vegan, vegetarian and gluten free, which made ordering easy. To start, I ordered the Pied de Mouton Mushroom Risotto, fried quails egg, shallot ash (£7) whilst my companion ordered the Parma Ham wrapped Scallop, parsnip puree, vanilla butter (£11). My main was Half Lobster, garlic butter, fries and salad. Again, the presentation was fabulous although the lobster was a little on the small side, but for £18 that's probably about right. My dining companion went for the Roasted Hake, heritage tomatoes, broad beans, samphire, crab and caviar tortellini (£14.50). By now, it was time for dessert, and whilst I opted for the artisan cheese selection, my companion ordered the Dark Chocolate Mousse, mango marshmallow, honeycomb (£6). The cheese selection was pretty hefty, with a choice of five costing £2.95 for one, £6.75 for three and £9.95 for all five. Served with chutney and crackers, mine came with just the chutney and quince jam to make it gluten free. Both desserts were fantastic, with the presentation of the chocolate mousse resembling a small garden, especially since it was served in a terracotta bowl. The cheeses were delicious, and with the tomato chutney and quince jam were fine without crackers, although I would have liked gluten free bread had it been available. Not ready to stop, we also ordered cocktails. Mine was the Bakewell Tart, a very sweet treat to end my meal, followed by a black coffee to restore some balance. I'd absolutely come back to Three Church Road, to try both the fixed price menu and the afternoon tea. A relaxed, refined environment, this is the place to bring the parents or grandparents for some serious brownie points. It's also a great spot for a special occasion, as there's plenty of rooms to choose from meaning you could enjoy a meal or some drinks in a semi-private environment. The service was very attentive when we visited in the evening, and it was quiet enough to be able to unwind after a busy day at work. Three Church Road is a great addition to Edgbaston. Full of quirky yet sophisticated design features, there's plenty of reasons to visit. *With thanks to Three Church Road and Delicious PR for the complimentary meal. We Brummies are spoiled for choice when it comes to Chinese and Pan Asian food. There's a whole host of authentic restaurants and eateries to choose from, including Wok to Walk. Located on New Street, Wok to Walk is new to the city but big worldwide. With stores in London, Bristol and beyond, they're an international brand that's all the more distinctive for their bright orange boxes. I rocked up after work to try out this new noodle bar. With a great central location, there's no denying the lunchtime and after work appeal of this place. With room inside to sit and eat at a bar and a full view of the flaming hot woks used to cook up every dish, it's welcoming and entertaining in here. With plenty of wood features there also the ability to charge your phone wirelessly or the old fashioned way. Behind the counter, there are large menu boards explaining the Wok to Walk concept. Every single dish is made up fresh to order. At the bar, the deli style fridge shows you everything that's on offer, from meat to mushrooms, so that you can decide what to put in your bespoke box. Diners first choose a base of noodle, grain or vegetable mix. There's plenty of options here from rice noodles to whole grain rice to make it as healthy as you like. Next, you can pick from part two of the menu, which covers meat, tofu and vegetables, each of which is individually priced and advised at no more than four. Finally, pick your sauce, all of which are free, and add toppings if you like for an additional fee. The simplest option is a base and sauce, which comes in at a bargain price of £3.95 for a box stuffed full of healthy but filling options. Once you start to add meat and veg, the price goes up, but everything is clearly priced up. The best part is that they're great for anyone with dietary requirements. Vegetarian? No Problem hold the meat. Vegan? Try to vegetables and rice. For me, this was great as I could create a dish that was perfect for me and there was plenty of dietary information around to help me make the right choice. I picked a whole grain rice box with Koh Tao sauce (green curry) along with prawns, shitake mushrooms, pak choi, broccoli and bamboo shoots, topped off with coriander for colour. I added a bottle of Coke Zero (not so healthy I know) too. Watching my dish being made up was great fun, as everything is portioned out using scoops that only touch one ingredient making it great for cross contamination control. Your items are then put into a bowl and handed to the chef who cooks everything up super quickly on hot woks. Finally, its put back into the box and ready to eat. My portion was absolutely huge, and I was impressed from not just the cross contamination and dietary requirements side, but also from the portions which are more than generous. My meal was hot, filling and pretty spicy, making it perfect for a hearty meal on the go. Overall, I'd highly recommend Wok to Walk. Fast, filling and fresh, don't forget to drop by the next time you're around. *With thanks to Wok to Walk and East Village for the complimentary meal. Nosh and Quaff is no more! But have no fear, Jailbird is here. Still part of the Lasan family, Jailbird has taken over what was once Nosh and Quaff on the corner of Colmore Row, staring at the back of the Floozy in the Jacuzzi. Reimagined as a New York Seafood and Steak restaurant, I was invited to try it out for myself in some delightful company. The ground floor has been completely reimagined, with the focus now on creating a bar lounge complete with a large bar and booth seating. The bar itself has moved away from the right hand side by the entrance and onto the left hand wall. The upstairs is now more of a dining space, flipping things around from before. We were welcomed at the bar and offered a cocktail. The bar team whipped up something brand new for me, based on preferences for citrus and a little sweetness. I personally love it when a bar team is allowed to exercise their creative muscles, so this was good to see. Upstairs, we took in the new look space, complete with quirky features and a decidedly green theme complete with plenty of plants. Our table was wooden and roomy, whilst the seats were plush and comfortable; a good thing considering it may take you a little while to get through the gigantic steaks on offer. As my fellow diners were browsing the menu, they were offered Bread and Cheese (£5.50), although this was sadly not gluten free. I had a feeling I wouldn't mind once I'd clocked that the smallest steak on the menu is a mere 16oz! Interestingly, between visiting and writing this review, the menu online now includes smaller 6oz, 8oz and 14oz steak options. Spoilt for choice since I adore both seafood and steak, I opted for a seafood starter and steak main, although I had seriously considered the whole lobster. I chose the Black Risotto with Prawns (£8.95), although the Black Risotto with Confit Black Garlic was also available for vegetarians. My starter was absolutely divine; creamy black rice risotto infused with rich butter, topped off with juicy, succulent prawns. I tried the non prawn version too, and this was also delicious and well worth ordering as either a starter or main. Another diner had ordered the Scallops'n'Bacon, one of the most popular dishes on the menu, which also looked succulent. Onto the mains, I decided to try the 16oz Flat Iron Steak (£26), which comes served with Thick Seasoned Hand Cut Chips. Believe it or not, I've never ordered a 16oz steak, but when it came to the table I was seriously impressed by the size of it! Although I did eat almost all of it, most people would probably struggle which is why I'm glad to see there are now smaller sizes available. The taste was good, with a lovely glaze on top to add flavour. The chips were absolutely huge, and could perhaps be cut down. I would also recommend ordering something green such as the Creamed Kale with it to add some variety to the dish. If you're not one for steak, I would recommend the Black Risotto as a main or perhaps the Flat Iron Chicken or Whole Lobster if you've come with an appetite. By now, dessert was definitely off the menu, but there were plenty of options including Coconut Panna Cotta and Ice Cream for gluten free diners, or Cherry Sponge, Chocolate Tart and Banana Mess if not. There are also some dessert wines and port if you prefer to round off your meal with a little bit of something sweet in liquid form. The new Jailbird is a sophisticated dining spot that commands attention. Conveniently placed for the business district and Snow Hill station, it's a spot for both drinking and dining with an air of old world sophistication. Meals here don't come cheap, but neither would you expect them to considering the steak is sourced from the same supplier as Fiesta Del Asado. The portions are exceptionally large in true American style and the service throughout was good. If you're looking for a slap up meal, somewhere special to celebrate or to impress on a date, Jailbird is a great choice. *With thanks to Jailbird and Paul Fulford for the (huge!) complimentary meal.